John Preedy, Bandmaster in 1920's. Ross Band was formed in 1924. The band thrived and competed at Crystal Palace and Alexandria Palace. After a break for World War 2 the band started up again in 1947. 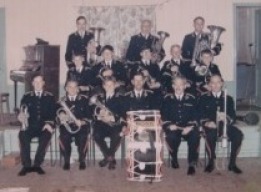 The band continued until the late 1970's. In 1984 a public meeting was held to see if the band could be reformed. 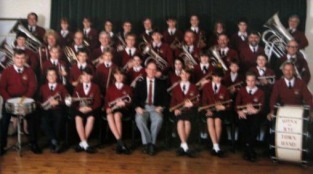 In January 1985 the new band started rehearsing with just 13 players. Ross Town Band in 1926. This photograph was sent to us by the family of Jack Dwan, who would have been 9 years old when the picture was taken. 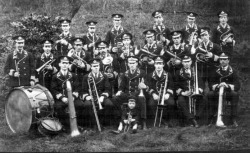 Ross Town Band in the 1930's. On the lawn of the Railway Hotel (now Henry St car park). 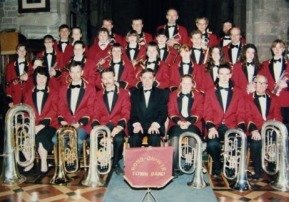 Band in 1990 with Musical Director George Taylor. Concert in Lea Village Hall - late 60's. Past Musical Director, Peter Ryland, sat far left, middle row.